Later this month, deadlines permitting, I’ll be releasing a game for desktop platforms and Android called A Puzzling Present. 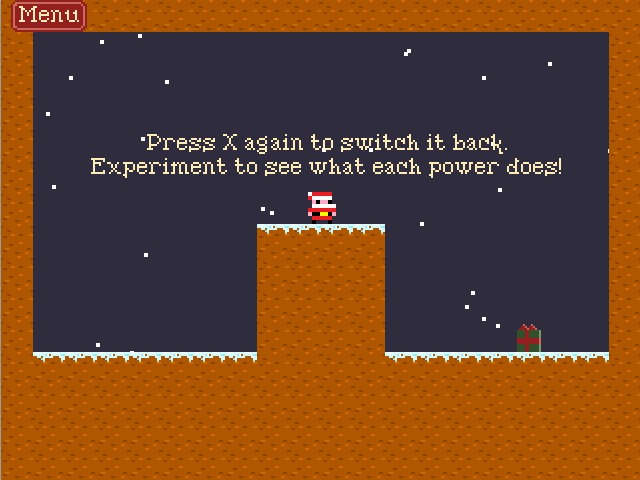 It’ll be a Christmas-themed platform game, with game mechanics and level design by the new Mechanic Miner system. It’s going to be released for free (because it should be!) and it’ll also include a way for you to help ANGELINA and myself out with the research by telling us what you think of the game as you play it! The idea behind the game is that Santa has been sucked into a mysterious Christmas present, and you have to help him escape! You need to make your way through multiple worlds to get Santa out, and each one has its own special game mechanic invented by our system. The worlds will be broken up into ten individual puzzle levels, where you have to figure out how to use the mechanic to reach the exit. Simple and hopefully fun! For the first time, ANGELINA will be benefitting from the input of a professional artist, which is really exciting! I’m delighted to introduce Harriet Jones – who you may know better as half of the excellent Unlimited Hyperbole podcast – who’s working to create some great logo and store art for us so we can show ourselves off properly and hopefully get lots of people interested in our rather experimental game! We’ll also be taking advantage of Kevin Macleod‘s generosity yet again by using some of his Christmassy music for the game as well. It’s only a small project, but I’ve done my best to make it feel complete and fun to play. I’m still tweaking a lot of stuff with the game, and ANGELINA is hard at work generating levels for the mechanics it found, but I’m hoping to release the game on December 15th on all platforms. That’s under two weeks from now! Ulp. For more information you can check out the PressKit() page for the game which has screenshots and more information. I’ll post more about the game closer to release, or you can follow me on Twitter to hear me moan and celebrate the final days of development (in roughly equal measure). A Puzzling Present Is Out!